Winter sports and any holidays that involve spending plenty of time outdoors in the snow and ice can be treacherous, and lead to accidents if you’re not aware of the dangers. 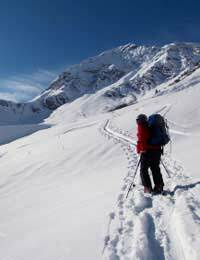 Even just walking on snow and ice can be tricky, and so if you’re just going out to explore your surroundings without so much as a ski in sight, you still need to be aware. First, make sure that you have decent footwear on, in the form of some well designed, strong and properly insulated boots. Ensure that they have sturdy rubber soles so that there’s less chance of slipping on icy patches. Take short steps and walk more slowly – not only do you get to take in more of the surroundings but it makes it easier to respond to a change in the texture of snow, or an unexpected slide. If you want to ice skate, ski or snowboard, you really should have lessons with a qualified instructor first. It will help you become acclimatised to your chosen sport, make you safer on the slopes or rink, and even help you to learn how to get on and off a ski lift! Do some exercise before you go. There are some fitness activities and exercises that you can do before hitting the slopes to get yourself ready for winter sports activities. It’s also important to stretch before and after you go skiing or snowboarding. Frostbite can cause permanent damage, and is a severe reaction to cold temperatures which causes freezing in the deep layers of skin. If you’re getting frostbite, you’ll notice a loss of feeling and numbness in extremities (usually fingers, nose, toes or ears) and the skin might also appear waxy or pale. Hypothermia happens when your body temperature drops too far, and the symptoms you need to watch out for are uncontrollable shivering, slow and slurred speech, stumbling, drowsiness, loss of memory and exhaustion. If someone with you starts to show any symptoms of either condition, try to warm them up slowly and get medical help for them straight away. Start with their trunk and mid-section, and if possible use the heat from your own body to help warm them back up. Leave arms and legs until later - warming the limbs first can drive colder blood toward their heart and potentially cause heart failure. Get the affected person into dry clothes as soon as you can, then wrap them in a blanket. Don’t give anyone with frostbite or hypothermia tea or coffee, or anything containing caffeine, and the same applies to alcohol. Caffeine can make the heart beat faster and speed up the effects of the cold, while alcohol can slow it down and also increase the effects of cold body temperatures. Snow Blindness is what happens when your external cornea is damaged by ultra violet light, and can be very painful. Often you won’t know you’ve been affected until the day after the damage happens. The symptoms are a feeling of ‘gritty’ eyes, not being able to tolerate bright light, blurred vision and watery, painful eyes. If you’re affected, protect the cornea from any further damage, and allow yourself at least 24 hours out of the sun. You can also try bathing your eyes in a teaspoon of table salt per cup of boiled water. Prevention is better than cure though – so try to remember to take some good quality wraparound sunglasses with UV filters when you are out in the snow! Dangers of Snowboarding: What Can Go Wrong? How Dangerous is Snow Mobiling?